Cooler temperatures and calmer winds helped firefighters make some progress on dozens of wildfires burning in the bone-dry West, including one that forced a tiny southwest Idaho town to evacuate on Thursday. The break wasn't expected to last long. Dry, windy weather, and temperatures over 100 were forecast for the next seven days. There are now 70 large fires burning in 12 states, with nearly 15,000 firefighters on the lines, reports CBS News Early Show national correspondent Hattie Kaufman. Officials are so concerned about resources being stretched thin that they're considering bringing in firefighters from Canada and Australia. "We have about 80 percent of our available hand crews assigned. About 80 percent of our heavy- and medium-lift helicopters are also assigned," said Ken Fredrick of the National Interagency Fire Center. "There should be enough rain in Arizona and New Mexico to end their chances of large fires for quite a while, and that will free up some crews and other resources that we can reassign onto fires and their trouble spots." A blaze that burned nearly 200 square miles near the Nevada state line threatened the town of Murphy Hot Springs and its 50 homes, said Brock Astle with the U.S. Bureau of Land Management. Residents were told to leave because of fear they wouldn't have a way to escape if the fire spread, similar to the evacuation of the small town of Jarbidge, nestled in a tight canyon near the Idaho line. "The bottom line is, if the fire goes into the canyon, the likelihood that it can be stopped is slim to none," Elko County Sheriff Dale Lotspeich said. Crews contained a fire that had burned 14 square miles near the Idaho National Laboratory, U.S. Department of Energy officials said. Roughly 700 workers at the lab's Materials and Fuels Complex were told to stay home Thursday because of the blaze, and the Idaho State Police intermittently closed U.S. Highway 20 to give crews room to strengthen a fire break designed to keep the fire from jumping the highway. The highway was reopened Thursday night. 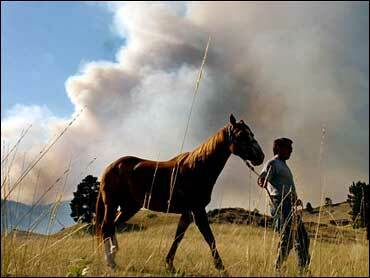 "Over the last four days we've had over 1,400 new fires start" around the West, said Frederick. Though many of the fires were caught and contained while they were still small, a number of them have grown substantially, he said. The U.S. Bureau of Land Management put Nevada on the top of its priority list. The federal designation brought in resources from neighboring states to assist firefighters, who acknowledged they were stretched thin by the blazes that stretch across most of the northern third of Nevada. Firefighters were getting a handle on a wildfire that had threatened hundreds of homes on the edge of Reno. It was about 15 percent contained and some of the 600 firefighters on scene were being dispatched to other fires. "The reason we have a lot of fires going is because we've had repeated waves of lightning, combining with hot temperatures and a lot of dry fuels out there, so our firefighters are really busy in the West right now doing a lot of hard work," Frederick told CBS News. The nation's firefighting preparedness was raised to its highest level Thursday, which opens the door for help from outside the U.S.
"It gives us the ability to consider bringing in international firefighting resources if necessary if the resources get further stretched here, Roger Petersen with the Northwest Interagency Coordination Center told CBS News correspondent Stephan Kaufman. No such help has been requested yet. In Northern California, overnight downpours helped crews battling nine fires burning about 17½ square miles near the Oregon border, where flames came within a half-mile of more than 300 homes in and around Happy Camp. "It did slow the fires down some, but the forecast doesn't show any rain in the near future," U.S. Forest Service spokesman Dwane Lyon said. "We're anticipating that we're going to be fighting aggressive fire again this weekend." The largest wildfire in Oregon, near Riley, had grown to more than 211 square miles and was threatening a handful of homes, officials said. Utah was so dry that some communities banned traditional July 24 fireworks that members of the Church of Jesus Christ of Latter-day Saints normally shoot off to celebrate the 1847 arrival of Mormon pioneers in the Salt Lake Valley. In Southern California, a 48-square-mile wildfire had slowed and an evacuation order for about 50 homes in its path was canceled, although residents were urged to be ready to flee if flames made a sudden run. The fire in Los Padres National Forest was still dangerous but its eastern movement was reduced as it left steep slopes and crept into flatter terrain, U.S. Forest Service spokeswoman Helen Tarbet said. "The weather is kind of cooperating," Tarbet added. "It's cooler than it has been and it's really not expected to move a whole lot."